1. What is your favourite part of being a designer? "I love the whole process of making something from concept to finish. I also love the diversity of projects - such as photoshoots, blogs, and fashion shows." 2. What was one of your favourite projects? "I really enjoyed being part of Saskatoon Fashion & Design Festival last year. It was a great experience and I was able to show our collection at two different events over the weekend. It was also where I met a few other Saskatoon designers for the first time and other people in the industry who I've since collaborated with." 3. Does your personal style rub off on your designs? "Yes, absolutely. Before we started Whiskey Teacup we were making pieces to wear ourselves and it evolved from there. It's not such an influential part of our designs now, but there's always an element of personal style." TIARA: Whenever I style an outfit, I always begin with a statement piece and then add solid coloured pieces to really compliment the look. I really wanted to bring out the soft delicate colours in this kimono and I did so by adding the lilac purple crop top to really accent it and make it pop. I feel like this is such a great outfit to wear to a summer event, like SFDF POSE! TIARA: As soon as saw this top, I immediately thought it would look best if paired with vintage. I styled this embellished top with up-cycled denim shorts and suede boots to really accentuate the vintage vibe. I decided to be minimalistic with jewellery and let the scalloped design on the top stand out. Lace and suede boots... seems Stevie Nicks may have had a part to play in inspiring this outfit! TIARA: I decided to pair this tank top with boyfriend jeans to create a super casual look. I added a choker and open-toe boots help to dress up the outfit, and add eye-catching details. This outfit is perfect for a summer evening out on the town. TIARA: I felt like I needed to channel my inner Wednesday Addams and create an all-black outfit. 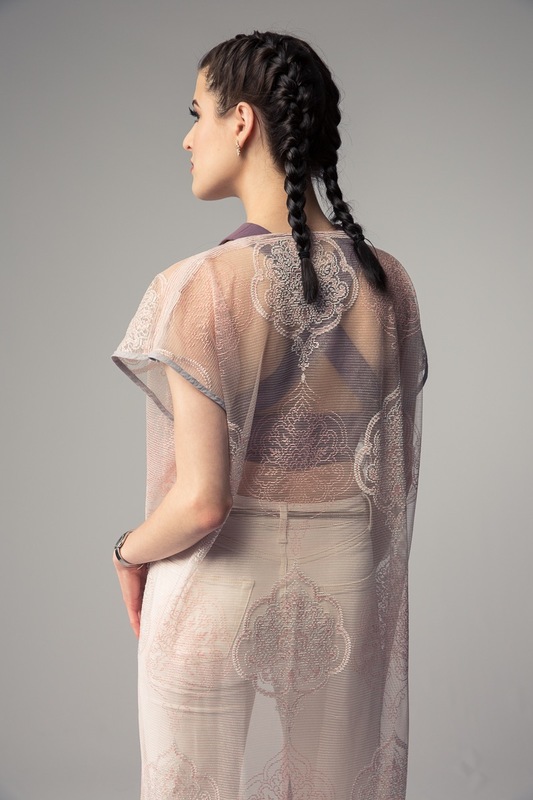 I chose to dress up this gorgeous sheer kimono with a lace top, skirt, and a vintage purse. I find the key to styling black on black is incorporating different textures, and I think this look really shows just that! Thank-you Laura for taking the time to speak with me, and also lending a few of Whiskey Teacup's gorgeous pieces for the photoshoot! To see more Whiskey Teacup designs, come down to River Landing on Sunday June 5th and see them featured on the POSE runway! And.. to learn more about Whiskey Teacup make sure to read the 2015 Designer Profile here. Find Whiskey Teacup on Instagram and Facebook!